The Society of Estonian Career Counsellors is the authorised organisation for accreditation of career counsellors and career information specialists. The professional standards establish the requirements on knowledge, skills, experience, values and personal characteristics necessary for the career specialists. Qualifications accreditation ensure the professional delivery of career services. 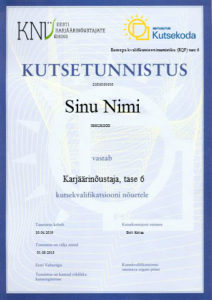 Two major employers of Estonian career professionals, Estonian Unemployment Insurance Fund (Estonian public employment service) and Foundation Innove value the accreditation of occupational qualifications and have thus incorprated the requirement in professional guides and pay extra for qualified specialists. The costs of acquireing the qualification, if successfully, are covered by the employers mentioned hereinbefore. Guidance professionals working in the private sector can benefit from the professional qualification while applying to participate in different field related projects and programmes. If you have any questions about accreditation please contact kutsekomisjon@kny.ee.